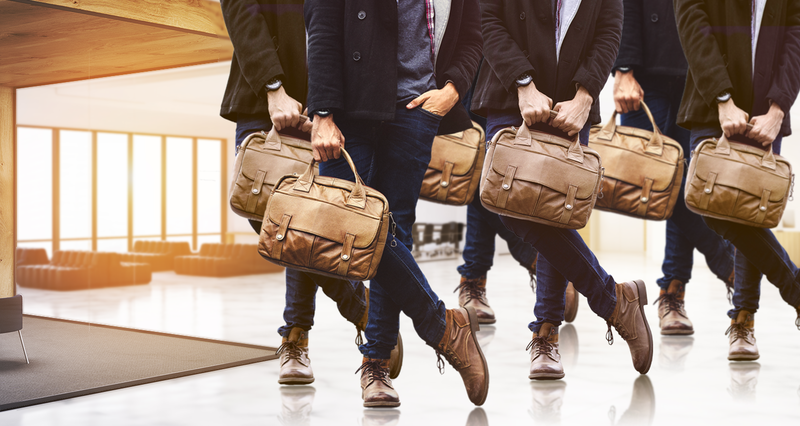 Watch the lobby security tapes on fast forward and see if you have an army of briefcase-toting Clones coming to work each day. What happened to all the quirky folks who dominated the early years? The surfer dudes, the Segway riders, the coffee addicts who converted to Jamba Juice in drink, attire and attitude? Success happened to them. And to you. Well, congratulations on your success: it honors you and you it. But as an entrepreneur, the status quo isn’t for you. You don’t want to relocate your business to Cloneville, so act now to protect your team. It’s time to strip off their uniformly brown overcoats, to teach them to think outside the cubicle, to revert to their former Quirkville roots. You’re wise to the chaos and fears that are hallmarks of entrepreneurship, and you’ve given the living-dead a new lease on life. And the business is running smoothly and growing again. The child has become an adult. Many of our customers come to us reminiscing of those wonder years, looking to trade a briefcase for a lunch pail full of shiny rocks, frogs or flowers: Whatever the zeal of the afternoon. MyObjectives scorecards reward teams for setting aside some time every quarter to ignore the No Flying In The Lobby signs, to spread their wings or at least try new folds in paper that keep a plane aloft for a few more seconds, a few more feet. We guide you to prioritize the work, to acknowledge that not everything you can work on needs to be worked on, at least not this quarter. The MyObjectives Success Zone gives everyone the same target, as defined by them, while staying aligned with overall business goals. We set 1,000 points as the most you can get in any game period on a scorecard. But anyone who reaches 700 reaches the Success Zone. This gives the surfer dudes and the contemplative poets room to dream and create. That’s The Stretch Zone, the Innovation Safe Zone, the Risk Yard … the place your Clones have stenciled and laminated No Admittance and No Exit. Read through your objectives and ask of each: What if we accomplish this early? Write down the answers your closest advisors come up with. Call these your stretch objectives. Wander through the implications of achieving these stretch objectives. See yourself on the far side of overachieving, of beating risk, or nullifying the worries of your Clones. Here’s an example your Clones can print in triplicate and bi-fold into their briefcases. Imagine yourself announcing to your company that you had found and acquired not three but FIVE Segways! The living-dead would perk up. And the Clones might — just might — find a small Segway sticker to customize their staplers with. The Jamba Juice crowd would crush their coffee house paper cups and resurrect their logo’d 24-ounce smoothie delivery system (Editor’s note: We’re not sure that a cup, a lid, and a straw constitute a “system” but the Quirky crowd nod knowingly when we phrase it that way). Teams that add a stretch objective to their work plan balance their scorecard and signal that they want a little excitement, a little risk, a little entrepreneurship in their lives, too. We’re always surprised and impressed by their creativity and ingenuity, the ways they propose to push your business forward. MyObjectives doesn’t reward them with points for achieving stretch objectives: That would be counter-productive! Stretching is where the journey is the reward. After all, the focus you promote is on the work that is critical, essential and important. Once a team reaches the Success Zone they continue to stretch for their own reward. It’s the dessert after the meal. The paper airplane that flies farther. The Jamba Juice cup holder astride the Segway. A little bit of stretching by each of your teams will add up to a future that’s fun, purposeful, and delightfully exciting. It is Growth Propelled. This is the final entry in our five-part Growth Curve series. Thank you for growing with us, for curving in our groove. Contact us for more or to share your growth story. We need to hear about your living-dead reincarnated as risk-taking Segway drivers.